Are Electronic Gadgets Making Singaporean Kids Myopic? Five stones, chapteh, congkak, goli (marbles) – these are the toys of yesteryear. In this digital era, tablets, mobile phones or laptops are the new toys. Nowadays, it is too common to see a child as young as three years old staring intently at a tablet or smartphone. A study led by Dr Nirmala Karuppiah, a lecturer of Early Childhood and Special Education at National Institute of Education, found that 65% of Singapore’s children have played games using electronic gadgets by the age of three. This trend is worrying as exposure to electronic gadgets for a long time can cause eyestrain, and eventually myopia, or short-sightedness. Studies have ascribed the usage of computers, smartphones and video games to increasing myopia rates worldwide. 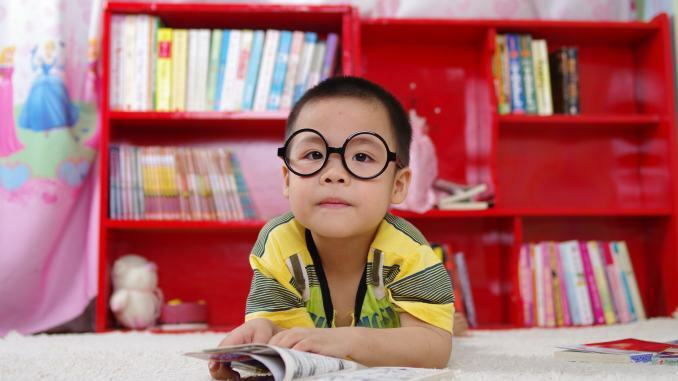 Another study by the Singapore Eye Research Institute and National University of Singapore concluded that childhood myopia will lead to a higher risk of developing high myopia (optical prescription of above 500 degrees) and serious eye conditions later in life. High myopia precipitates severe eye problems such as retinal detachment cataract and glaucoma or even blindness. Moreover, children who misuse or excessively use electronic devices might face a higher risk of developing a gaming addiction, engaging in cyber-bullying or being violent, according to Dr Karuppiah as quoted in the Straits Times. They might also have problems socialising with peers. In addition, studies have shown that children who play electronic games prior to bedtime might have trouble sleeping. Sad to say, Singapore is number one in the world for the prevalence of childhood myopia in seven to nine year olds. 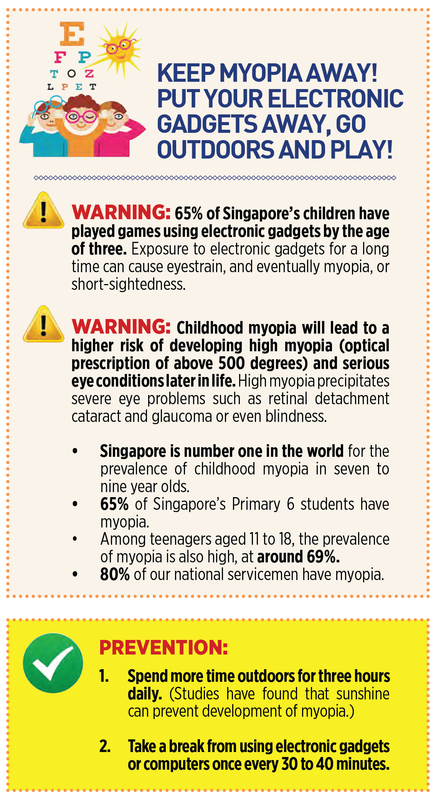 65% of Singapore’s Primary 6 students have myopia. Among teenagers aged 11 to 18, the prevalence of myopia is also high, at around 69%, and 80% of our national servicemen have myopia. And these figures are on the rise. By 2050, myopia will affect at least 5 million people in Singapore, and 15% of the population are likely to develop high myopia. Referring to a global study published in the medical journal Opthalmology, nearly half of the world’s projected population, or an estimated 5 billion people, will likely be stricken with myopia by 2050. In Taiwan, where 95% of school leavers are myopic, legislation was enacted to restrict the amount of time that kids spend on their electronic devices. Children under two are banned from using electronic devices and those under 18 are prohibited from using their electronic gadgets for an unhealthy length of time. Parents who breach these regulations can be fined up to NT$50,000 (S$2,192). Thus far, Singapore has not put in place such regulations, but parents can do their part in slowing down childhood myopia by ensuring their children take a break from using electronic gadgets or computers once every 30 to 40 minutes and allowing them to bask outdoors for three hours daily, as studies have found that sunshine can prevent development of myopia. A Glimpse Into the Success of Union Energy: What’s Next? Are Elderly Too Old for Technology?